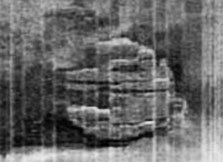 Side scan sonar image of 197-foot-diameter unidentified sunken object first discovered on June 19, 2011, 275 feet down on the floor of the Baltic Sea between Sweden and Finland. Side scan sonar image © 2011 by Ocean Explorer X-Team, Sweden. 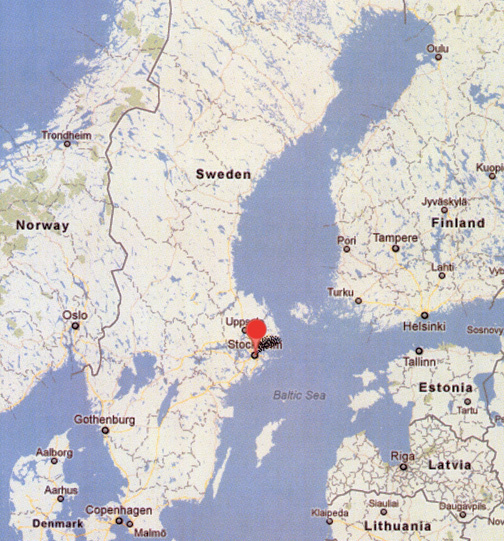 The red circle marks Stockholm, Sweden, facing the Baltic Sea, one of the largest brackish seas in the world. The water is a mixture of fresh and salt waters, but only about 35% as salty as the ocean. The Baltic waters are so murky that divers cannot see more than a few feet. The basin between Sweden and Finland was formed by glacial erosion. The Baltic Sea is about 1,600 kilometers (1,000 miles) long and averages 193 kilometers (120 miles) wide, with depths ranging from 55 meters (180 feet) to the maximum depth of 459 meters (1,506 feet). June 28, 2012 Stockholm, Sweden - Two long-time divers who joined together in the mid-1990s to hunt for sunken treasure in shipwrecks at the bottom of the Baltic are Peter Lindberg and Dennis Asberg. They are co-owners of Sweden Ocean Explorer, a Stockholm company devoted to searching for sunken shipwrecks and treasure, who call themselves the Ocean X Team. Previous PostPrevious Part 4: Mysterious 12,000-Years-Old Gobekli Tepe, Turkey – Interview with Geologist Robert Schoch. Next PostNext Part 6: Mysterious 12,000-Years-Old Gobekli Tepe, Turkey – Was Underground Cappadocia Another Escape from Catastrophe?